Education | Downside UP Ltd.
A group of Downside Up specialists from Russia (Moscow) together with their colleagues from Yekaterinburg have recently made study tour to the UK. Russian teachers have already made several visits to the UK, enjoyed fruitful meetings with British colleagues for sharing new ideas and experiences, for analyzing different educational programs and approaches. This time their main task was to learn more about speech and language development programs for early age, which British specialists use in their work. In the light of the changes in the educational system taking place in Russia today it is very important to analyze British experience: how different types of organisations (state, municipal, non-profit) support families and how they coexist and cooperate. And to look closely at the way the system of family support for children with special needs is implemented in the UK. Tatiana Nechaeva, director of Family Support Center of Downside Up says: “We knew beforehand that we would see a more favourable picture of the situation than the existing one in Russia. Early Intervention System exists in the UK more than 30 years and there are no doubts that family-centered care model is the most appropriate model of early intervention for children with special needs. In England children with special needs are not isolated from society: there are a lot of different institutions of early intervention, classes with specialists at training centers and charitable organisations, special nurseries and schools, inclusive institutions and also special classes at mainstream schools are available. Moreover, a child, his or her parents and teachers get full support of specialists regarding a wide range of matters”. Downside Up’s team has visited the classes on speech development at two non-governmental organisations. One of them is “21 and Co” which conducts its activities at the Langdon Down Centre in Normansfield, where Dr. John Langdon Down lived and worked. “21 and Co” is a charity offering help and support to children with Down syndrome and their families in South West London, Surrey. Its main activities are: speech and language development for children, social and communication skills, support for parents who have recently received a Down syndrome diagnosis for their child, support for brothers, sisters and other family members, awareness-raising activities in the local community. Another organization - “Downright excellent” was founded by parents of children with Down syndrome about 8 years ago. This organization is also fundraising and conducts speech and language group therapy and communication and social interaction skills development for children of 0 to 9 years old. All programmes are conducted by experienced specialists. In England programmes, developed by Down Syndrome Educational Trust are extensively used. In particular, See and Learn programme, which is the basis for many speech and language therapists from the UK and is a standard for other approaches to follow, depending on a child’s needs. 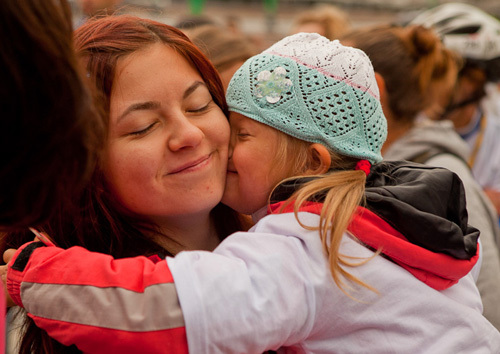 Unfortunately, there are no standardized programmes for children with Down syndrome in Russia. “Downright excellent” organizes and delivers classes and meetings with families at Golden Lane Campus, which includes primary school, special educational needs school for children with motor problems and Early Intervention Center “Stay and Play”, where children can come with parents, play and also pass the time. Different children, including those with impairments of support-motor apparatus, are close to each other, move freely and play together. Specialists, volunteers and parents are helping them and for children with impairments of support-motor apparatus there is also a massive park of different technical supplies. And everybody feel comfortable! This space in full conformity with such descriptions as “a completely accessible environment”, “barrier free environment”. “Bird in Bush Community Nursery” – is a municipal nursery and an excellent example of inclusion of young children with special needs with their typically developing peers. This wonderful nursery is a part of The London Early Years Foundation (LEYF), which began as the Westminster Health Society in 1903. The main task of this foundation is to support and to offer high quality education and healthcare services to families with children of early and pre-school age. 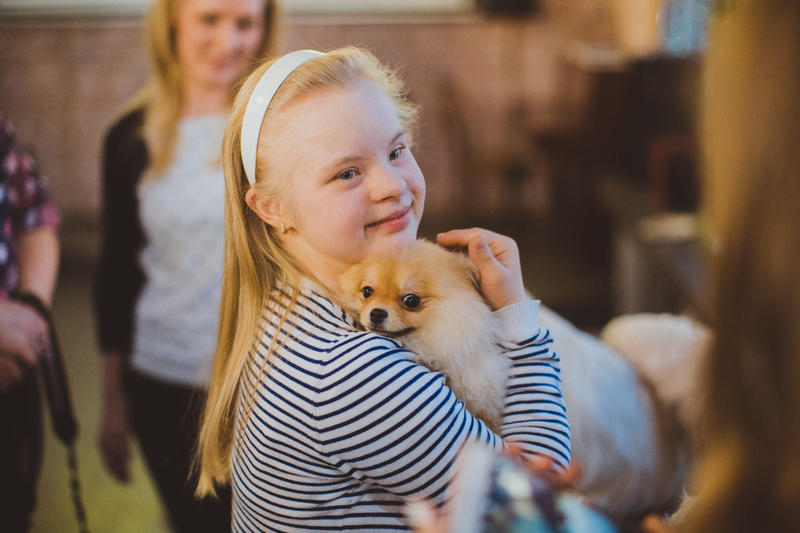 During this study-tour Russian specialists have visited the Early Years Center Wandsworth, which offer support to young children of 0 to 8 years who have significant or complex needs or disabilities (including Down syndrome) and their families living in Wandsworth. This Center not only delivers the classes for children but also offers information and practical support to families in finding family support services and trainings, helps to contact with other parents etc. The Early Years Center Wandsworth also offers support in processing documents for getting special support of a child at education institution. Inclusion of young children with special needs in mainstream nurseries and schools in London is an accurately regulated process of accompanying, including choosing a tutor, visiting specialists of Early Intervention Centers and getting methodological recommendations from them, and also legal support of family if required. For example, voluntary group of parents Positive Parent Action (PPA) offers information and psychological support for families, raising children with special needs. Not only Downside Up’s specialists from Moscow participated in this study tour, but also their colleagues from Yekaterinburg: representatives of two pilot enterprises of Downside Up in Sverdlovsk region (in Project “Dissemination of family-centered model, developed at Downside up”): Loginova Nadezhda, director of Center of psychology-pedagogical rehabilitation, Zarechniy and Drobakhina Inna, deputy director for educational work of “Rehabilitation center for children and teenagers with special needs”, Kamensk-Uralskiy. And longstanding partner of Downside Up - Tatiana Cherkasova, the chairperson of “Solnechnyie Deti” (“Sunny Children”) parents organization. 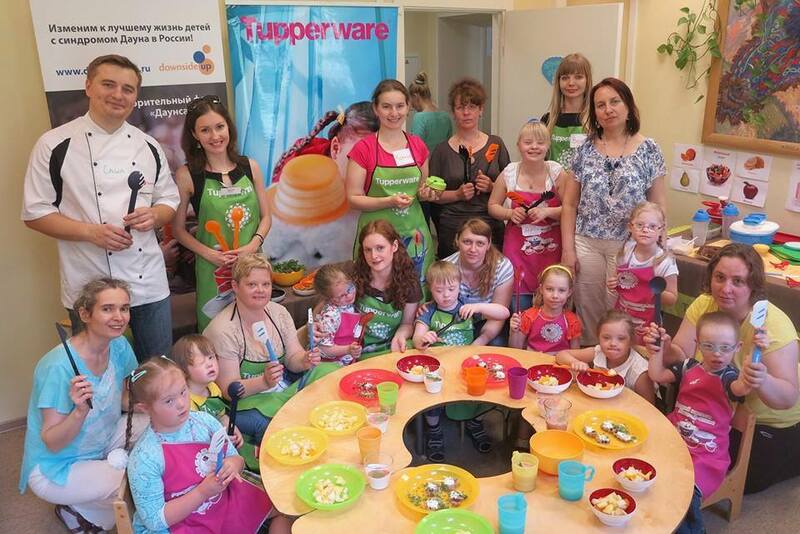 Read more about Cooking class with Tupperware Inc.
“A visit to Downside Up, where we saw parents bring their little children to a junior group learning session was enough for us to decide to take our child home. We rushed immediately to collect all the necessary documents to take our daughter home. She was six weeks old then…And all these years Downside Up Early Intervention centre has been the only place where we received help". Ludmila Kirillov, the mother of a 6-years old girl Nika. There is hope specialists in maternity homes will no longer advise parents to abandon children with Down syndrome – we wrote about it in our previous issue. But is this really enough for families to have confidence in the future? It is the lack of objective information and early intervention which makes parents so unsure of their capabilities to raise a special needs child. More than once we were witness to parents’ changing their mind and refusing to abandon after they were given support and told their children had future. The Kirillovs are only one of the 3700 families registered on Downside Up programs. Please make a donation and help us support the families of children with Down syndrome. £32 is the cost of a home visit of an early intervention specialist to a family of a 16-months old child. Let every child go home with their families. Thank you for your generosity! Read more about LET ALL THE CHILDREN GO HOME! Unusual and inspiring news came to us from abroad: Eli Reimer is one of the first people with Down syndrome, and possibly the first American teenager to climb the highest mountain in the world. 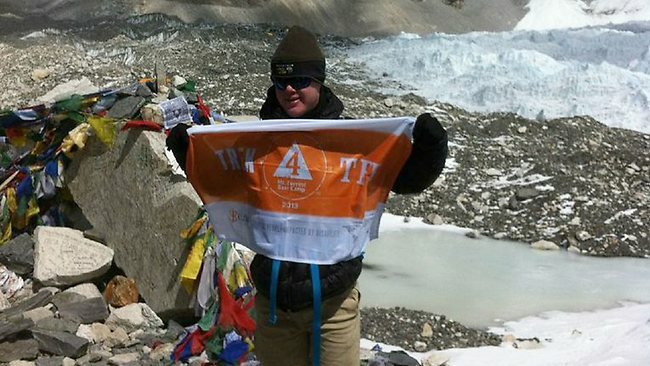 For two weeks he climbed to the stunning height of 5300 meters. When reporters asked him if he though the climb was difficult (a climb which, even for an experienced climber to climb - is often considered difficult), with a broad smile, he replied: "No". The teen's father said that before they accomplished this feat, they consulted with doctors and physicians, whom entirely supported this idea. "We closely followed his breathing, blood pressure, oxygen saturation level, as he climbed up the mountain" - said Justin Reimer. "And I want to tell you that it is his stamina and desire to conquer the summit that was for us a real example," - said the father, who was touched.